It’s easy to think of King’s Lynn simply as a port that has lost much of its trade, and may lose more after Brexit – but it has a wealth of medieval and Georgian architecture and some interesting cultural offerings too. Unlike, say, Boston in Lincolnshire, it seems to have been enhanced by migration from Eastern Europe, with Polish and Lithuanian shops that are not just places for the homesick to buy sausages and pickles, but offer new and interesting products – there’s a really good butchers, apparently, and a bar. The splendid Majestic Cinema, built in 1928, was saved from demolition in 2001 by being listed (after a dogged campaign) and continues to offer interesting films, and the King’s Lynn Festival is excellent and well supported. All in all, the town has some rough edges but plenty of heart. Its name comes from the Celtic word linn, meaning pool (as in Dublin or black pool), and North, South and West Lena were all salt-making settlements where sand was separated from brine and used to reclaim land, creating three islands between the four fleets or streams running west into what is now the Ouse (until around 1220 this flowed into the Wash just to the west near Wisbech). By the 1280s the market by the original St Margaret’s church was being held every day except Tuesdays, and the town was extended to the south to the River Nar, beyond what is now the park known as The Walks. As well as two marketplaces, the town also had two guildhalls, and all of them have survived to this day. 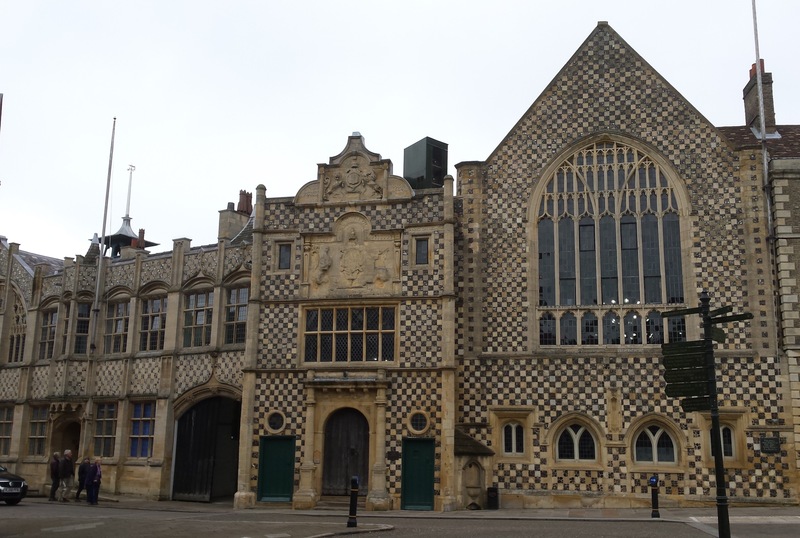 On the Saturday Market Place, the Trinity Guildhall was built in 1421 and is the largest surviving medieval guildhall in England; its chequered stone and flint flushwork front is very striking, and behind are the assembly rooms, added in 1766. It became the town hall, and now houses the Stories of Lynn museum and café, which allows access on Tuesdays and Sundays to the town hall, where you can see the town’s charters and regalia (notably a fourteenth-century cup of enamelled silver and a sword) as well as ceremonial silver that testifies to the town’s seventeenth-century royalist bias, almost unique among East Anglian towns. 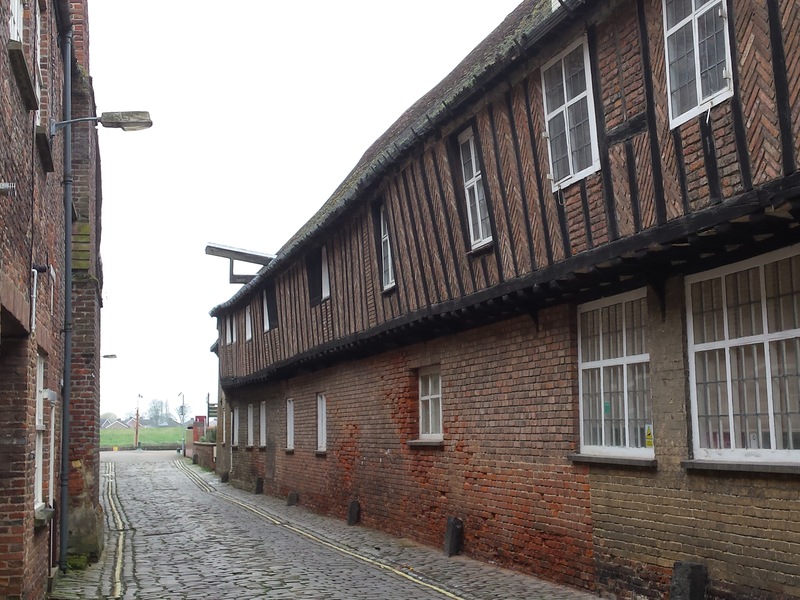 The other guildhall, to the north, contains a rare example of an Elizabethan theatre (Shakespeare’s company played here, although there’s no proof that Will himself was in town); owned by the National Trust, it’s now the King’s Lynn Arts Centre. The town actually became Lynn Regis in 1537 when Henry VIII changed its name, as part of his undermining of the Church, and this was soon anglicised as King’s Lynn (the apostrophe can go astray). The town’s most striking building is the Custom House, built by the Purfleet in 1683, and now housing the tourist information centre. 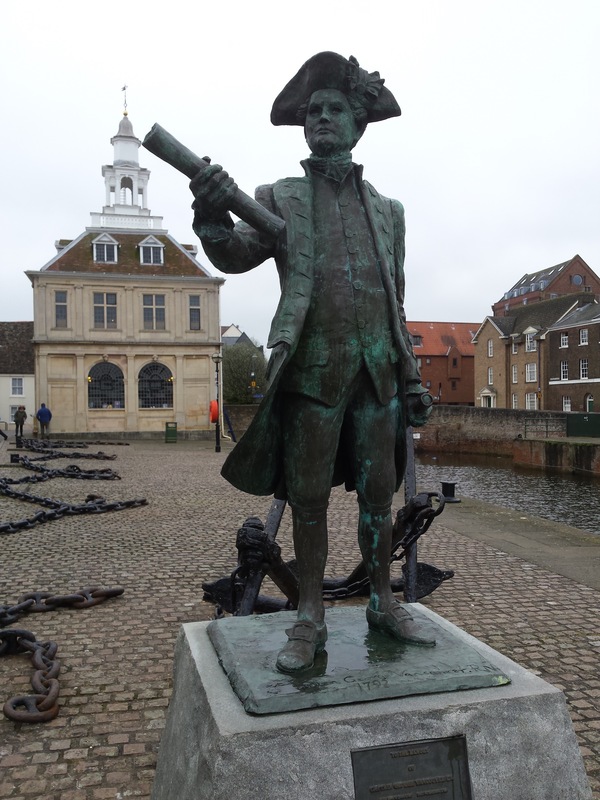 Beside it is a statue of Lynn’s most famous son, Captain George Vancouver (1757-98), who sailed on Cook’s second and third voyages and led his own expedition in 1791-5, most notably surveying every inlet of the Pacific North West coast, including the island and the future city that now bear his name (see these posts), and north past the Lynn Canal as far as what is now Anchorage in Alaska. His father was Deputy Collector of Customs, but the family had arrived from Coevorden (then spelled Coeverden – hence Van Coeverden) in the eastern Netherlands in the late 17th century, following Cornelius Vermuyden, the great Dutch engineer who drained the Fens and straightened their rivers. Georgian houses stand on land reclaimed from the river (Nelson, King and Queen Streets mark the original waterfront), and some grand Victorian buildings were added, notably the neoclassical Corn Exchange (1854) on Tuesday Market Place. The drainage of the fens led to the growth of agriculture in the area, but Lynn was losing its importance as a port as trade shifted to the west coast, for access to the Atlantic. Modern development began with a Campbells Soup factory in the 1950s, followed by designation as a London overflow in 1962 and predictably unfortunate town centre redevelopment. Trade with the EU picked up in the 1970s, but in the 21st century the best hopes for regeneration seem to be pinned largely on developments by Sainsbury and Tesco. St Margaret’s church (which became King’s Lynn Minster in 2011) is superb, but it’s not the town’s oldest building – this title goes to All Saints church, which may have some pre-Norman components, although it was rebuilt in the fifteenth century. 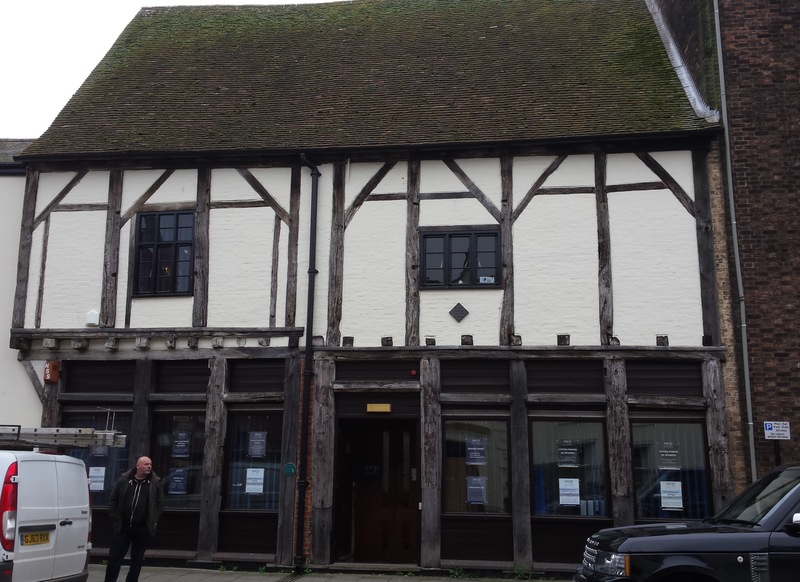 The oldest secular buildings are 28-32 King St, where a timber-framed house was built c1300 over the remains of a stone house dating from c1200; the next oldest are the remains of St Margaret’s Priory, built in the fourteenth century and now private houses on the south side of the church. But for me, the town’s most striking building is the Chapel of St Nicholas, bigger than most churches, which was built in 1146 and rebuilt after 1380 in Perpendicular style with huge windows (their stained glass was destroyed in 1941, so the chapel is now very light). It’s known for the memorial slabs (near the font) to a couple of local men called Robinson Cruso, which may have been seen by Daniel Defoe. It became redundant in 1989, but is beautifully maintained and open five days a week. Opposite the Minster is the vicarage, which was home to the organist and historian of English music Dr Charles Burney – his children included the novelist Fanny (born here in 1752), who wrote in her diaries about Lynn life, and James, who also sailed with Captain Cook (and witnessed his death) and became an admiral. Just south is a fine Georgian mansion known as St Margaret’s House, fashioned in 1755 for the brewer and mayor Edward Everard from the rear of the Hanse House; dating from 1475, this is the only surviving hanseatic warehouse building in England, and now houses the Rathskeller restaurant. 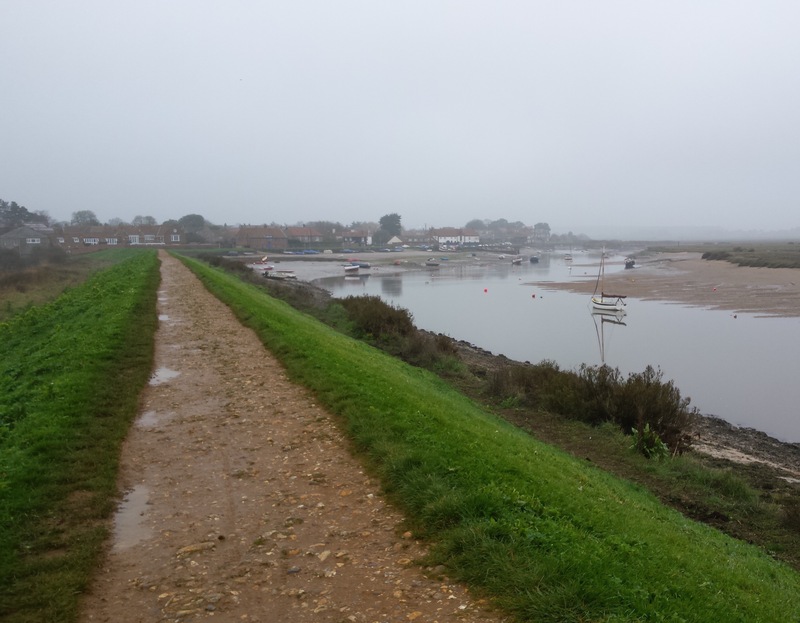 Just north on the waterfront is Marriott’s Warehouse, built around 1580, which also houses an attractive restaurant, as well as the Green Quay Wash Interpretation Centre, explaining the geography and biology of the estuary/bay between Norfolk and Lincolnshire. Just north of the Chapel of St Nicholas (the patron saint of sailors, of course) is True’s Yard, a lovely little museum created out of a couple of fishermen’s cottages, which maintains the memory of the tight little North End community, where almost everyone was known by a nickname; Ralph Vaughan-Williams came here in 1905 and collected various folk songs, the best-known being The Captain’s Apprentice. The main Lynn Museum is housed in the old Union Chapel next to the bus station; the main hall is full of good local history, but its main claim to fame is the recreation of one half of the so-called Seahenge (obviously it was on dry land when it was erected). Fifteen to 20 oak trees were felled in 2049 BC, yielding 55 oak posts up to 3m high which were raised in a 6.6m-diameter circle around an inverted stump, on which the body of some important figure may have been placed for what the Tibetans call ‘sky burial’. It was a bit of a surprise that the railway north from Cambridge and Ely not only survived the Beeching cuts but was electrified in 1993 – but this was at the cost of reducing some of the line to single track, and providing a strong enough power supply (and long enough platforms) only for four-carriage trains. In our hypermobile present age people are popping up to London all the time and commuting to Cambridge and beyond, so the aim is to double the train service to Kings Cross to two per hour – but this depends on re-doubling the line through Ely North Junction, and the money isn’t currently there. Being Britain, where all rail projects are far more complex and expensive than on the continent, the government has simply commissioned another study. It’s not far (a couple of hours by bike, an hour and 20 minutes by the twice-hourly Coasthopper bus) to Burnham Market, centre of a group of villages on the North Norfolk coast that are all associated with the childhood of Admiral Lord Nelson, and all have pubs named after him (the Nelson, the Hero) or one of his protegés, such as William Hoste. Burnham Market has become known as Chelsea-on-Sea (though it’s not actually on the coast) and is totally clogged with visiting 4X4s in summer; the other Burnhams (Thorpe, Overy etc) are as lovely but don’t have the Humble Pie deli, the Tuscan Farm Shop, Gun Hill Clothing Co. or Gurney’s fish shop. Fortunately, a new 186-space village car park was opened in 2016, which should help. At the attractive little (largely 14th-century) church of St Mary the Virgin I found that Nelson’s daughter Horatia, who lived here with her widowed uncle, was engaged to one curate but ended up marrying his replacement in this church in 1822 – so Jane Austen wasn’t making this stuff up! The coastal wetlands are very popular with birdwatchers and others who like bracing walks to welcoming pubs, but this area always reminds me of one of my favourite films, Never Let Me Go. Kazuo Ishiguro, author of the equally fab original novel, studied creative writing at UEA in Norwich, and it’s to Cromer that they go on a day trip (though it’s Clevedon pier in the film). At the end the doomed lovers go to a stranded boat, which is on Holkham beach, rather more famous for the closing scene of Shakespeare in Love.